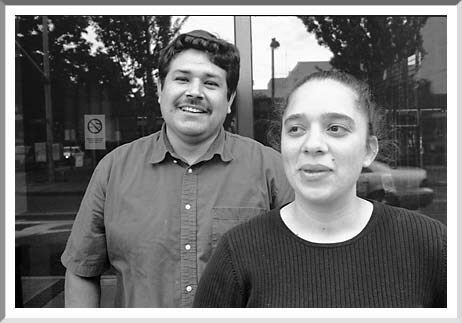 Since January of 2003, Rosa Lopez and Carlos Santana have tutored adults in Spanish literacy two evenings a week at the LCC Downtown Center. (First-language literacy greatly facilitates the learning of English as a second lanquage.) After they took a training course offered by the Mexican Consulate in the fall of 2002, Lopez and Santana volunteered to teach the class. Mexico's National Institute for Adult Education supplies teaching guides and textbooks at no cost, and class participants can take exams to earn primary and secondary certificates from the Mexican education system. "Two of our students have passed the first two tests," says Santana, a native of Jalisco who came to Oregon 12 years ago to pick beets. He learned English in LCC night classes, earned a transfer degree last summer, and now works as a bilingual assistant at Springfield High School. Lopez grew up in California, worked for NGOs abroad, and graduated from the UO (ethnic studies) in 2001. "I worked in ESL before I graduated," she notes. "Now I'm getting a masters in educational leadership. My thesis is about learning skills for adult ESL students."